Curated Cocktails: Dark Desires Happy Hour at the Museum! Join us for Happy Hour at the Museum! $5 specialty cocktails created by Outpost at the Goodland’s resident mixologist Chris Burmeister, themed art activities in our Art Lab, & a set of love songs by DJ Darla Bea. FREE ADMISSION to the current exhibitions: Tam Van Tran, Aikido Dream and Bloom Projects: Michael DeLucia, Appearance Preserving Simplification. 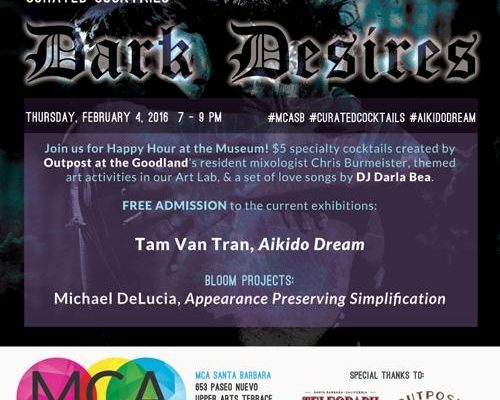 Register for Event: Curated Cocktails: Dark Desires Happy Hour at the Museum! Your ticket for the: Curated Cocktails: Dark Desires Happy Hour at the Museum!